Born 1901 or earlier ? Born 1911 or later ? Morris and Rose Kesselman lived originally in Lukashivka, Kiev district of Russia (now in Ukraine) and moved to England in 1895/6. There were several Kesselman families living in that part of Russia at that time, particularly in the area around Zhitomir. No connection has yet been established between them and the family of this Morris Kesselman. Marks Kesselman, the last of their children to be born in Russia lists his birth place on his British Naturalisation certificate as Locshifker, Kiev, Russia. Morris's gravestone at the Edmonton Federation Cemetery names him as Shimon Moshe ben rav Yisroel - his father's name was, therefore, Yisroel or Israel. It is possible that Morris was known to his family and friends as Shimon or Simon, as a descendant named after him bears that name. There is a family legend that says that Morris Kesselman's father (or grandfather) had a daughter who hid in a large bread oven to escape a Cossack attack during a pogrom. * For infomation on Rose Kesselman's maiden name and first name see Sebalofsky / Seibelovsky page. ** Samuel Kesselman's details remain something of a mystery. He is mentioned on Harris Cassonman's (June) 1901 army papers (see below) as a younger brother but doesn't appear on the 1901 census, though that census was taken in March. Nor can other records currently be found. It is quite possible that this is not another brother, but an early family nickname for Pinkus who later called himself Peter. ***Sadie is listed on Rose Kesselman's gravestone, but she is mentioned nowhere else and there is no record of a Sadie Kesselman born to this family. **** Leah and Israel Oderwehr changed the spelling of their surname to Ordever. According to Marks Kesselman's naturalisation case notes, recently made available (see below), Morris Kesselman arrived in England in 1895, two years before his wife Rose and their children in 1897. Since Minnie was born in London in 1896, there is an inconsistency here. Minyeka Kesselman (later called Minnie) was born in 1896 at 5 Rahns Court, which lay (close to Rix Court) parallel to the southern end of Back Church Lane, Whitechapel off Ellen Street. It had been predominantly an overcrowded Irish area well-known for the riotous behaviour of its inhabitants. Back Church Lane runs south from Commercial Road to Cable Street, and this, then, is where the Kesselman family first settled in London. 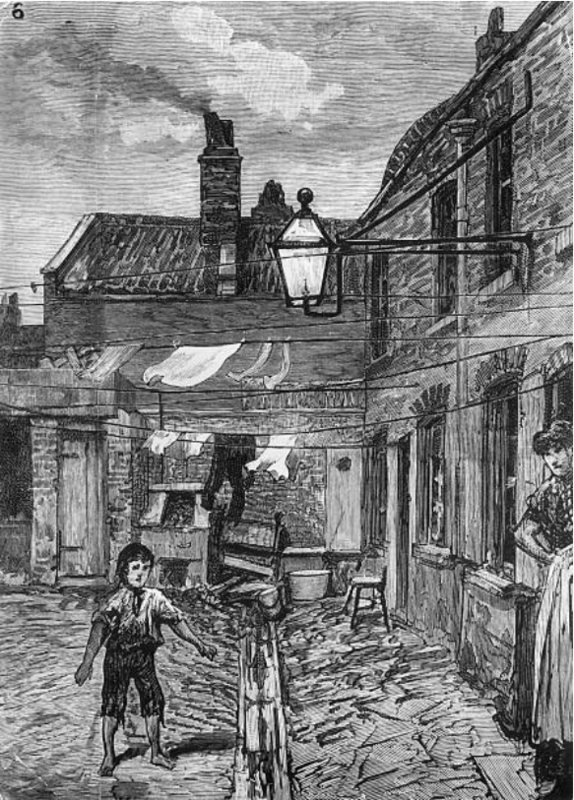 The Graphic of 20 February 1886, from which the image comes, describes it as, 'a good type of the East End court,' but note the open drain at the foot of the picture. The Kesselman family appear as Cassonman or Casserman in the 1901 England census. By 1911 they had reverted to the name Kesselman except for the eldest son, Harris, who was married with a family by that time, and who appears on his own census form as Cassonman, continuing to use this surname until his death in 1915. It is possible, though that the 1901 census enumerator misheard the name Kesselman and assumed it began with a 'C' and was pronounced 'Casserman'. It often happens that English speakers on hearing the name Kesselman assume that it begins with a 'C', and that the speaker has a strange way of pronouncing what is assumed to be 'Castleman'. And interesting that the name 'Castle' was adopted as a surname (or stage name) by at least 3 of the family. From 1901 until their deaths, Morris and Rose lived at 38 Winterton Street, St George in the East, Stepney, London - a road coloured black on the Booth Poverty Maps a few years before, and therefore considered to be one of the most impoverished streets in London. Interestingly, this may have been a step down from their previous address in Rahns Court though only a short walk away. Their sons Abraham, John, Pincus and Philip lived with them in the 1920s. Their surname occasionally appears in the Electoral registers as Kessalman. Before 1890, Winterton Street was called Devonshire Street, and no.36, next door, had been one of the last residences of Elizabeth Stride one of Jack the Ripper's victims. [See the Mizelas family page for information on Thrawl Street.] Winterton street was a turning off Commercial Road on the south side almost opposite the entrance of Sidney Street. It no longer exists: part of Watney Street Market having been built on the land it once occupied. There do not seem to be any pictures of Winterton Street. This is Planet Street (once known as Star Street), the road next to Winterton Street and running parallel to it. It's reputation was almost as bad as its neighbour. Like Winterton Street, it no longer exists. Winterton Street was bombed during World War 2, but still existed in the 1960s, though without many houses. It was finally demolished in 1969. Marks Kesselman married Rebecca Mizelas in 1916. Sometime before that he had been offered the chance to study singing in Italy, but had been unable to take up the offer, possibly due to parental pressure from his father. When he became a naturalized British citizen in 1949, his wife took British nationality also. Their names (together with their three children) appear on the Electoral Register at the end of the same year. KESSELMAN states that he was born at Locshifker [sic], near Kiev on 15.7.1890, of Russian parents, and that in 1897 he was brought to this country by his mother, his father having arrived here two years earlier. The family then settled in the East End of London, where KESSELMAN senior [Morris] was working as a cap presser, and the applicant has not left this country since then. No condition regarding his permitted stay here has ever been imposed. After attending the Jewish Free School in Spitalfields for one year, KESSELMAN was sent to the Lower Chapman Street L.L.C. School, and later to the Cable Street Higher Grade L.L.C. School. In 1903 he claims to have been awarded entrance scholarship at the latter school, and from 1910 until 1913 attended the Raines Foundation secondary school. Then, having reached the age of 16 years, he concluded his education and commenced working as a clerk at various establishments in the East End of London for a year. He then gave up this mode of earning a livelihood, and commenced working as a ladies' hat machinist, in which employment he remained for seven years. He then started working as a part-time agent with the Royal London Mutual Insurance Society Ltd., and in 1928 he became a full-time insurance agent, working on commission only, and he has continued in this manner to the present time, working for the same concern from the company's branch office at 78 Mile End Road, E.1. His earnings over the past three Income Tax years have been £578.16s.1d., £589.3s.10d., and £495.17s.9d. respectively. a) failed to notify intended change of address, (b) failing to report within 48 hours a circumstance affecting his registration [as an alien], viz. out of employment, and (c) failing to have an identity book." The period of unemployment mentioned was just before he started working as a part-time agent with the Royal London Mutual Insurance Society Ltd. as mentioned above. All those deemed to be aliens were required to have an identity book - [see Myszkowski page for an example]. The British Government had, in 1918, for some years been wrestling with the problems of British Citizenship and Immigration. Marks and Rebecca Kesselman and their family lived for a time at 10 Little Alie Street, and then in Clapton Square before moving to 40 Cleveleys Road, Clapton. When that house was bombed during the Blitz, the family had to live elsewhere. It took some years before they were able to move back. It seems that in 1918 John Kesselman (who would have been about 15) was fined 20s for striking a London Bus Conductress on the back of the head with a bundle of spoons because she wouldn't let him board her bus. She had smacked his face, and then pushed him off, and he had chased after the bus and re-boarded it. This was reported in the Hull Daily Mail on May 13 of that year using anti-Semitic language. Private Harris Cassonman of the Dorsetshire Regiment was killed in action in Ypres, Belgium on 21 April 1915 (the day before the 2nd Battle of Ypres began) leaving behind his wife Fanny (née Vinacour) and three daughters. There had been a baby son, but he unfortunately died, aged 10 months, a month before his father who was home at the time. It is easy to miss the personal aspect of how the family must have been affected by the events surrounding the death of Harris Cassonman and his son. In 1915, Rose and Morris Kesselman had to deal with the death of a grandchild, followed a month later with the death of their oldest son. Harris's wife lost her son and her husband, and her daughters their father and their brother. Harris's siblings must also have felt the loss. As late as 1923 the army still had not distributed money owed to families of those killed in the war. Harris had been killed in 1915. More than eight years later his family had not received this. The amount, though, was a paltry £2 4s 5d. Discharged - Having made a mis-statement as to age on enlistment. It seems likely that his distraught parents, anxious over Harris's disappearance had gone to the police who had tracked him down.